ALBRECHT DÜRER watercolour pencils are high-quality artists' colour pencils for drawing and colouring. They are extraordinarily versatile and colourful, but their special advantage lies in the ability to produce watercolour effects. A few strokes with a wet paintbrush, and you can convert a drawing - or parts of it - into a painting, with all the advantages of both techniques. The 120 colours can be blended to form an unlimited number of new hues, either in sharp contrast to each other or merging imperceptibly. Whether you use them as pencils for adding detail, or as a convenient form of watercolour paints, ALBRECHT DÜRER artists' watercolour pencils are a fascinating medium offering unlimited possibilities. 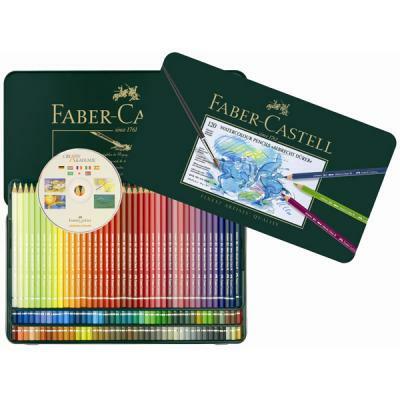 This tin contains the full range of 120 colours plus FREE Creativity Academy CD-ROM. Please note that at their widest point these pencils measure 8.3mm, so please make sure that your pencil sharpener can accommodate pencils up to 9mm. Please allow up to 7 days for delivery of this product.